January 2, 2017 – The motto of the Jalen Rose Leadership Academy is “Enter a learner: Exit a leader.” But this philosophy is something that the Detroit public charter school’s namesake founder feels is necessary for students to come out ready for the world they’ll face. Since it’s opening in 2011, the JRLA has produced two graduating classes with 100 percent of the 2015 and 2016 graduates accepted into college, military or technical school. The school currently has enrolled more than 400 students from ninth to twelfth grade. Rose attributes the success of the school to its leadership and college driven initiatives as well as its mission of empowering the students. “We empower the scholars through character, skills and knowledge so that they can have what it takes to be successful in this competitive world,” he said. Rose, 43, spent his 13-year career in the NBA as a small forward, shooting guard and point guard, with stints in Denver, Indianapolis, Chicago, Toronto, New York and Phoenix. He’s equally remembered for his years as part of the “Fab Five” at the University of Michigan, playing back-to-back NCAA Championships in 1992 and 1993. Eventually he moved on to entrepreneurship, authoring his first book, philanthropy and becoming an on-air personality on a variety of television shows and ultimately a sports analyst with ESPN. But the achievement gap among students in his hometown of Detroit, where he was a standout at Southwestern High School, was too great for him to overlook, so in 2011 he founded the school along with co-founder and entrepreneur Michael Carter. Rose understood the importance of uplifting the youth and his community through education. 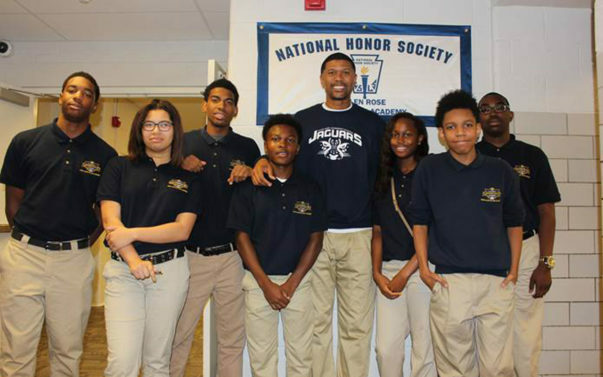 Instead of solely donating money to students through the Jalen Rose Charitable Fund, he wanted to impact the youth at the root in a more direct way. As he puts it, “your level of education should not be defined by your zip code.” But the reality is, that is not the case for many public schools across the nation. Since 1965, the Elementary and Secondary Education Act has allowed the location of an institution to determine the amount of dollars schools receive per student. This unspoken disparity prompted Rose to foster a public school in a private school environment. Rose hopes that JRLA is a beacon of hope for the students and the greater Detroit area. As a non-selective public charter school, it is open to all students and is not restrictive by zip code or income. Rose’s mission is to develop and support the students of JRLA through college graduation. And that goal is accomplished beyond academics and test results. JRLA also focuses on teaching scholars life skills, social skills and proper etiquette. Rose said he wanted to name the school after notable individuals that he admires but his team insisted that the school be named after him. “They told me, if you put your name on something, you’re going to own it,” said Rose. But because his name is on the building, he’s become as much of a father to the school as he is a founder.